Designed by Sir Sydney Camm the Hurricane would provide the Royal Air Force with its first monoplane fighter and would play a pivotal role for Fighter Command during the Battle of Britain. Flown by a number of 'aces', including author Roald Dahl, the type would spend twelve years in RAF service in a variety of roles. Discover a range of Hawker Hurricane facts in this article. Sir Sydney Camm the chief designer at Hawker Aircraft Limited was the man behind the Hurricane. He would also be involved in the design of a number of other well known aircraft such as the Hawker Typhoon and Hawker Hunter, he also played a part in the development of the Hawker Harrier. Based on the Hawker Fury biplane early designs of a monoplane aircraft to be powered by a 1,000-hp Rolls-Royce PV.12, later known as the Merlin, were originally known as the Fury monoplane before being developed into the Hurricane. The Hurricane prototype (K5083) made its maiden flight on the 6th November 1935 at Brooklands with Hawker's chief test pilot George Bulman flying the Rolls-Royce 'C' engine powered aircraft. When the Hurricane entered service on the 15th December 1937 with No. 111 Squadron it was the first Royal Air Force monoplane fighter. It would also be the first RAF aircraft with eight machine-guns and the first to fly faster than 300 mph. Flying from Vassincourt, France on the 30th October 1939 Pilot Officer Mould of No. 1 Squadron shot down a Dornier Do 17P which would be the first German aircraft shot down over the Western Front during the Second World War (1939 - 1945). Flying Officer Edgar Kain, known as Cobber Kain, who flew the Hurricane with No. 73 Squadron became the first Royal Air Force ace of the Second World War when he shot down his fifth aircraft in March 1940. He would shoot down a further 12 aircraft before he died in a flying accident on the 7th June 1940 aged 21. Squadron Leader of No. 242 Squadron during the Battle of Britain Douglas Bader flew the Hurricane Mk I, during this period he is credited with 11 aircraft destroyed, 4 damaged and 1 probable. Equipped with the type it was No. 303 (Polish) Squadron that would be the highest scoring squadron during the battle claiming 126 aircraft. Flight Lieutenant James Brindley Nicolson would be the only Fighter Command pilot to be awarded the Victoria Cross during World War 2. This was for his actions on the 16th August 1940 when, despite his Hurricane Mk I (P3576) being damaged by Messerschmitt Bf 109s, he shot down a Messerschmitt Bf 110 before bailing out. During the Battle of Britain Air Vice-Marshal Keith Park who commanded 11 Group would often visit airfields under his command in his own Hawker Hurricane Mk I (P3854) OK-1. During the battle Hurricanes flew around 35,000 operational sorties and would shoot down 55% of all German aircraft claimed, more than other aircraft, including the Supermarine Spitfire , and ground defences put together. The famous author flew Hurricanes and with five victories would become an RAF ace. Although originally designed as a fighter the Hurricane would be used in a number of other roles such as ground attack, night fighter and fighter bomber with the latter being nicknamed 'Hurribomber'. One of the more successful variants was the Hurricane Mk IID which was armed with a pair of 40mm Vickers 'S' anti tanks guns. These would be nicknamed the 'Flying Can Openers'. Known as the Hawker Sea Hurricane these would enter service with the Fleet Air Arm during May 1941. 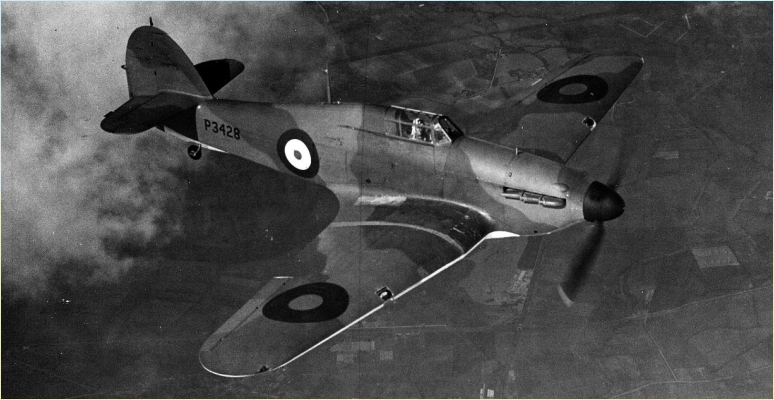 Early converted Hurricanes for naval operations were nicknamed 'Hurricats'. Stationed aboard Catapult Aircraft Merchantmen (CAM) and Merchant aircraft carriers (MAC) they would be launched by catapult when required. They would also operate aboard traditional aircraft carriers. It was the Mk IV which would be the first aircraft to use air-to-ground rocket projectiles on operations when they were used on the 2nd September 1943. The 15th June 1943 saw No. 527 Squadron, Castle Camps formed and they would use Hurricane Mk I (P2992) painted in a red/orange colour to help calibrate radar. As part of Transport Command's No. 1697 (Air Dispatch Letter Service) Flight, 1944 saw a number of Hurricanes underwing tanks converted to store mail. One of the most unusual ideas tested on the Hurricane during the Second World War must have been the slip-wing. 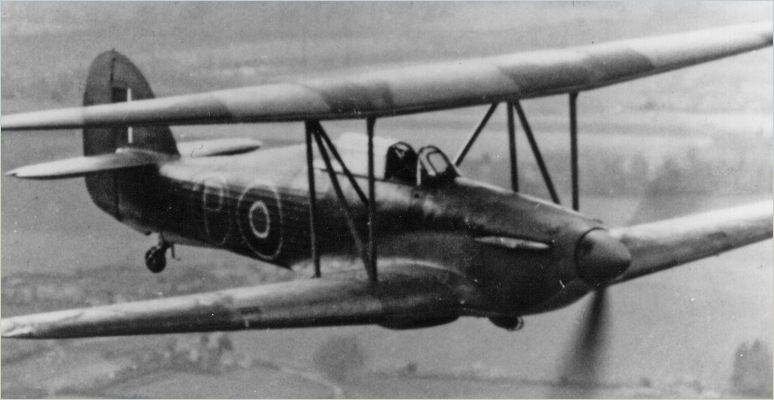 Known as the Hillson FH.40 Slip-wing Hurricane, this saw a Mk I (L1884) fitted with a top wing. This made the aircraft look like a Hurricane biplane but the extra top wing, which could hold extra fuel and help with lift on take-off, could be discarded when no longer required. No official two seat examples were built but two Mk IICs were modified in the field with the first flying on the 27th September 1946. The type would see service with 25 air forces around the world and during the Second World War would be used by some Axis air forces. Aside from the Royal Air Force one of the biggest users of the Hurricane was the Soviet Union who received 2,952 examples. Mk IIC (BE208) of No. 232 Squadron, Singapore flown by Squadron Leader Richard Brooker had force landed at its airfield and ended up in a ditch, the pilot was unhurt, and when the airfield was abandoned as a result of the Japanese advance the aircraft was captured. After repairs it was tested by the Imperial Japanese Army Air Service. 12 years service with the RAF came to an end with No. 6 Squadron. They would perform the last operational sortie of the type on the 13th January 1947 and were the last to have their Hurricanes, which were Mk IVs, replaced. This was two days later on the 15th January 1947 when they received the Hawker Tempest. During the Hurricane's production run a total of 14,583 were built in the UK and Canada. The last example ever built was at Hawker Aircraft's satellite factory at Langley, Buckinghamshire. Mk IIC (PZ865) was the last Hurricane ever built and would be kept by Hawker and would not see active service in World War 2. It flew in the King's Cup in 1950 in the hands of RAF ace Group Captain Peter Townsend and finished second. It would appear in the Battle of Britain (1969) film before being handed over to the Royal Air Force Battle of Britain Memorial Flight on the 29th March 1972 and is still flying today. To restore an example today to airworthy condition would set you back around £2 million pounds and take at least 26,000 hours.